Anupam Kher, a veteran Indian actor of international acclaim, received an honorary citizenship of Texas in the United States, yesterday, following a Senate Proclamation. 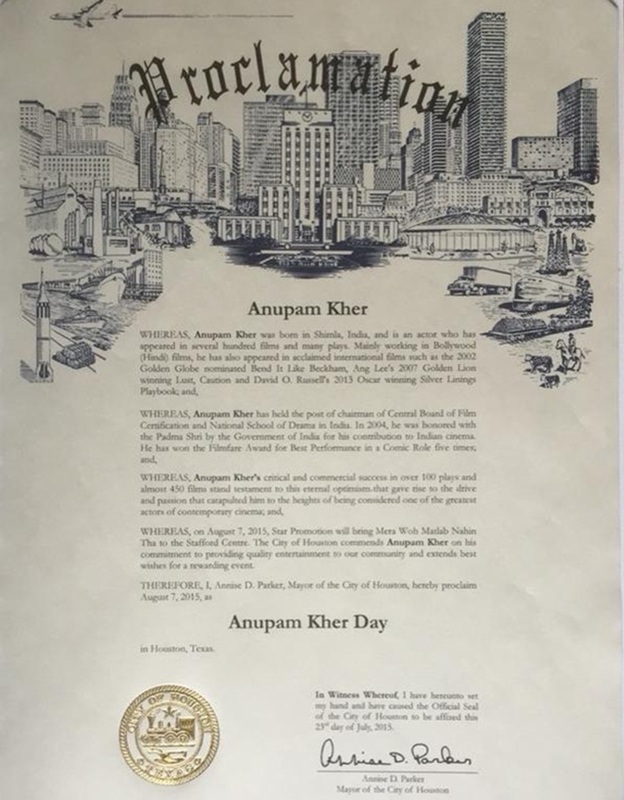 Since August 7 which the Mayor of Houston declared as Anupam Kher Day this year, it has been a celebration for the actor, who ventured into Indian Cinema with his debut movie Aagman in 1982 and shot to fame with Saaransh in 1984. 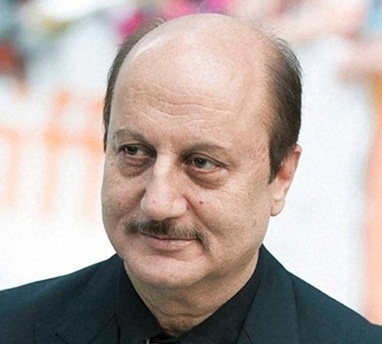 The North American state of Texas conferred the Senate Proclamation on Anupam Kher as a tribute to the overwhelming success of his theatre play Mera Woh Matlab Nahi Tha, which has been doing rounds in the American cities including Houston, Toronto and Vancouver since its first show on August 7, 2015. The stellar performance by Anupam Kher and Neena Gupta, who played the lead roles of an estranged couple in the play, earned them not only standing ovation at the theatre in Houston but also kudos all over the USA and Canada. It overwhelmed a milling crowd of Americans and Indian Americans with emotions. The play became such a hit that it was staged twice in Houston, and each show was powerful. 60-year old actor Anupam Kher is no new face to the American audience. He made his foray into Hollywood with his appearance in Bend It Like Beckham in 2002. He acted in Bride and Prejudice, Speedy Singhs, Lust, Caution, The Mistress of Spices, and Silver Linings Playbook. He is known for his appearance in the popular American TV show ER as well. Recently, the United Nations appointed Anupam Kher brand ambassador of “HeForShe”, a global campaign in support of gender equality. “HeForShe” calls upon men and boys to stand up against gender-based discrimination of women and girls across the world. He was awarded the Dalai Lama award for his philanthropic work for underprivileged children. The document from the Senate of Texas reads: “The Senate of the State of Texas is pleased to recognize Anupam Kher, who is being honored by the South Asian Chambers of Commerce for his appointment as a United Nations ambassador and champion for gender equality”. An overjoyed Kher is currently touring the USA and Canada to stage the play Mera Woh Matlab Nahi Tha. Indian Eagle congratulates actor Anupam Kher on success of his play and the newest achievement of being an honorary citizen of Texas.